Whether you want to keep valuables and dangerous objects out of the hands of young children or potential burglars, the CompX Timberline Cam Lock System is one of the most versatile and secure options you'll find. This universal lock can be used for both doors and drawers anywhere in your home to keep important files, medications, jewelry and much more under lock and key. Each cam lock kit comes with four different cams that can easily be switched out on the cam lock cylinder body. Two straight cams and two bent cams mean you'll have the right option for almost any situation. 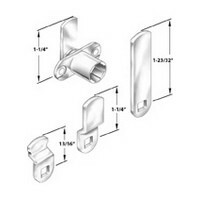 Order a vertical mount multi cam kit for use with doors or a horizontal mount kit to install on a bathroom drawer. You can get a combination mount kit as well for the ultimate in versatility. CompX Timberline locking systems can be found in both 90-degree and 180-degree rotation versions. These kits mount easily with ¾-inch material so you can have peace of mind knowing your property is safe. Contact our knowledgeable staff with more than three decades of woodworking experience to learn more about this reliable cam lock system. You'll get free shipping on top of our low prices with a PRO Membership!